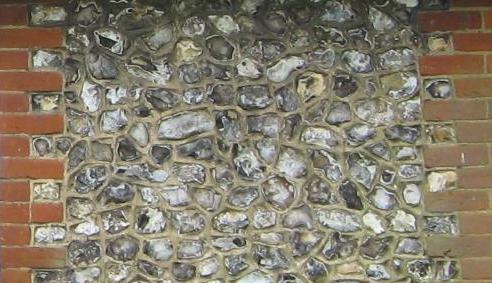 Flint is a black hard glass like silica with a white grey skin, found in nodules in the chalk, and particularly notable in South East England and East Anglia. It is used knapped or unknapped, sea rounded cobbles being prevalent on the coast. Field flint is brown from oxidisation from being exposed to the elements. Chert is a less pure form found in Limestone and also of a brown colour. A variety of building patterns are found including bungaroosh, a mix of brick and flint. Berry-Middleton Ltd is a small, professional building company based in West Sussex. Using traditional materials and techniques we undertake a wide variety of projects. They specialise in flintwork, but are also fully competent in many other building practices. These include roofing (slating and tiling), brickwork, stonework and hard landscaping. At Chichester Stoneworks our team represent over 250 years of award winning stone masonry craftsmanship. We have a passion for repairing, restoring and conserving our country’s historical buildings, preserving our heritage for years to come. In addition we are new build stone specialists, involved in the creation of beautiful country houses and internal/external features e.g. cantilevered staircases, fireplaces, porticos and hard landscaping in finely crafted natural stone. Our hands-on management team ensures the highest quality of stone masonry design, manufacture and installation. H.G. Matthews is a family run brickworks whose products include traditional hand made bricks, special bricks including coping and imperial sizes, glazed headers, salt glazed bricks, hand dyed bricks for weathering, brick arches and flint including field flint and knapped flint. Herts Renovation specialises in restoration brickwork. It is run by John Gorman, who is himself a craftsman bricklayer. John has been in the industry for 35 years. He was trained in brick renovation and restoration by Dr. Gerard Lynch who is an internationally acknowledged master bricklayer and historic brickwork consultant. The services we offer include gauged brickwork, enrichment restoration, conservation pointing, tuck pointing, arch construction and repair, flint work new and repair, lime work, colour washing and polychromatic brickwork. We cover Hertfordshire, Bedfordshire, Buckinghamshire, Essex, Suffolk and London.